Traveling in general has never seemed to live up to its expectations. The phrase "Getting there is half the fun!" has always led me to believe that "there" is no more exciting or interesting than the mode of travel used. The first few times I made the journey from Southern California to the Bay Area were compliments of Pacific Southwest Airlines, and while the fare of maybe $50 was certainly reasonable for the 1 hour flight, the abrupt change from one location to the next didn't allow the mind to make the necessary adjustments as easily as the body did. It was sort of like reading the first chapter in a book, and then switching to the last. 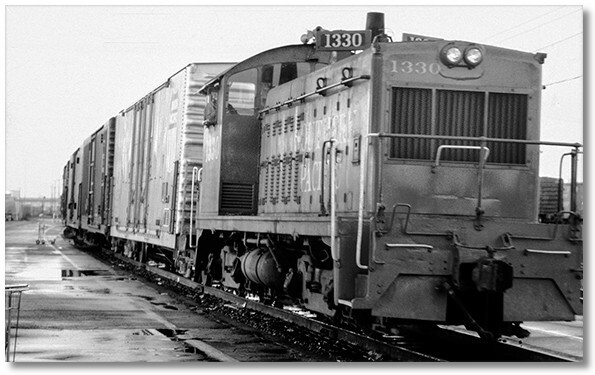 Hopping freight trains soon became the norm, and I had plenty of time to assimilate into my new surroundings. Enough time to where it sometimes felt as though I had read the first chapter of a book... then read it over again... and again. This particular time I was wandering around the Oakland Desert Yard, trying to find a dry place to hang out while I developed a plan of action. It had rained quite a bit the night before, and dodging lake-sized puddles required a keen sense of direction and purpose. The most direct way would be to catch a southbound out of the main yard and go down the Coast Route. This had been a few times on the "Gray Ghost", an overnight intermodal train that left the Bay Area at night and got to LA the next morning. The upside was that it was a fast train and didn't stop anywhere, so you could get on, go to sleep, and wake up reasonably close to your destination. The downside was that unless it was carrying autoracks you had to ride outside, and in the winter almost the entire ride could be done in pea-soup coastal fog. Going down the Central Valley was longer, the trains sometimes stopped to work, and you were treated to hours of Tule fog instead. It all boiled down, as it often does, to which train was leaving first. Since I was already in the Desert Yard, I looked around for a train to Roseville or Stockton, and then down the Central Valley. This was probably the first time that I was looking for a ride here during the day, and I immediately missed the cover of darkness, although trying to bypass the flooded areas was much easier if I could see where the water was. 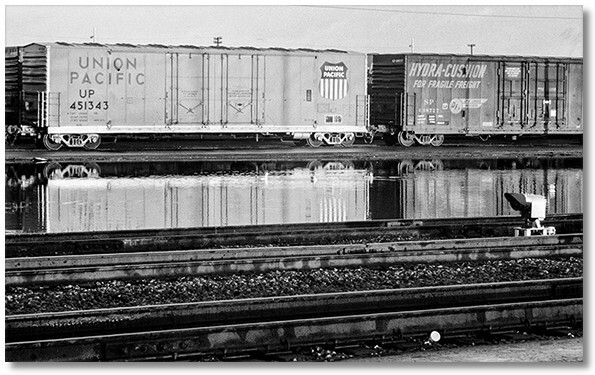 Eventually I found a boxcar with an open door adjacent to a gap between two cars, so I could watch a switch engine shuffle cars back and forth that I hoped would eventually be going my way. My roll of cardboard proved invaluable as just about every horizontal surface in the yard was wet (or under water). The switching finally stopped around noon, so I got up and walked around looking at the strings of cars left in its wake. The tracks that usually held cars going east were empty, and I couldn't find any yard workers to ask about schedules, so I sat down to ponder my next move. So far there had been nothing on the scanner to indicate a train being made up, but in a few minutes I heard someone ask permission to shove a caboose onto track whatever (I didn't get which track number it was). From where I was sitting I could see both ends of the Desert Yard and there was no caboose in sight, so I figured that it must be in the main yard, which would be at least a 10 or 15 minute walk from where I was sitting. 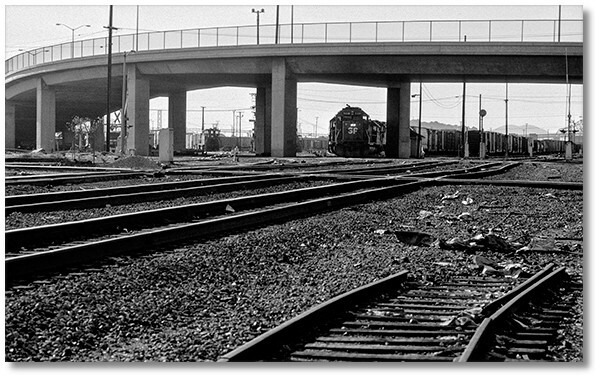 The problem was that I didn't know which end of the main yard the caboose was located in — if it was in the south end then it was going on the end of a train that would leave out of the north end of the yard, which meant that the train could be going in several other directions besides going to LA. Not wanting to embark on a long walk for no reason, I remained where I was with my ear glued to the scanner. I could hear the sound of a switch engine but couldn't tell where it was coming from. Then, above some buildings on the north end of the main yard I saw a trail of smoke that seemed to follow the switch engine sound, and work its way down into the yard. A few minutes later I heard on the scanner that they (the switch engine crew) were done with their work and were leaving, so I had to assume that it was a caboose that they were shoving, even though I never saw it. Owing to the abundance of puddles I had to circumvent I was surprised to realize that the freightyard was anything but flat. Apparently proper drainage wasn't something that carried much weight in freightyard construction. Deviating from the route of a flying crow, I cut through a "residential area" next to the yard, amazed at the zoning system in place around here. One block could have heavy industries like a huge metal forge or a place that manufactures rebar, and in the next block were rows of Victorian houses, albeit run-down, but without the benefit of some sort of buffer zone. Passing through the Victorians I wondered how much their value would increase if it wasn't for their location. A few more blocks and I emerged on 7th St. and stopped at my favorite liquor store in all of Oakland. In this locale White Port was revered as much as a prime varietal, and seemed to represent a good part of the overall sales. I carefully selected a few bottles, tilting them slightly while holding them up to a florescent ceiling light to look for sediment, which in this particular wine, played a role as important as the worm in a bottle of Tequila. Satisfied with my purchase, I continued down 7th for a block or two, then cut over to the mainline and followed it down to the south end of the yard. Along the way I passed the small yard where old passenger commuter cars were stored, now serving as temporary lodging for the local homeless. Now skirting a block of derelict buildings I saw an old '53 Chevy rocking back and forth as if there were an earthquake going on, but closer examination revealed a prostitute and her John conducting "business" in the back seat. As I passed she briefly looked up, gave me a quick smile, then went back to work, reinforcing the maxim that "Time is Money". At last I reached the south end of the yard, and just in time, as several units were backing down to a string of cars that was hidden around a corner. Reluctant to walk right into the yard in broad daylight, I retreated to a nearby loading dock to re-arrange my gear and drink some wine. An hour went by before I heard and saw the engines snake their way out of the yard and clatter across the Western Pacific diamond, so I grabbed my pack and stood by as the train crept by at a slow walk. A string of grainers appeared and as I inched closer to the mainline I saw a lone boxcar with both doors open a few cars behind, so I broke into a run and came along side the boxcar, looking inside for any other riders. The car was empty — clean and empty, so I tossed my pack inside then climbed in myself. My "view" consisted of block after block of the backs of industrial buildings, along with inner city debris and the folks who are attracted to it. 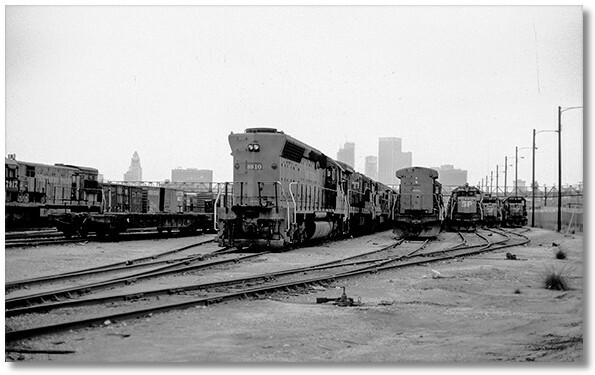 Details of the ride down to LA are lost to time and the clouds of White Port, but I do remember waking up stopped at a siding in a big city with a very strong smell filling the boxcar. Getting up to pee and figure out where I was, I saw that we were stopped on a siding right next to a place that apparently chromed car bumpers, as well as other items. How anyone could work in there with the smell is beyond me, and fortunately we were moving again soon and recognizing the bleakness of the landscape and the pale chalk-like sky I knew that we were coming into LA, so I gathered up my gear and quickly finished off the dregs of last night's bottle. Winding from one side of the river to another it seemed like this was as close as I was going to get to someplace where I could catch a bus, I dropped off the slow-moving train and found myself in the Bull Ring yard, a sort of storage yard for locomotives that had zillions of small palm trees growing everywhere. "Welcome to LA" I thought, where the sky was the same color as the sandy ground that I was walking over. The skyline of downtown was faintly visible through the smog, so I made my way through engine after engine that now was relegated to housing, as in Oakland, the local homeless. Soon I climbed up an ice plant covered embankment and turned to walk the final few blocks to the bus station, a huge building housing the very cream of Humanity. This was indeed the proper way to enter Southern California — with sufficient time to acclimatize myself to the change in geography, culture, and of course, air quality. With several hours to wait until my bus would leave, I walked out the back of the building and down the alley a ways, where I shared a bottle of White Port with a gentleman who looked like he could appreciate the subtle nuances it possessed. The day could only get better from that point... for both of us.